Yesterday we celebrated Easter as a Family of FIVE (2018)! Last year on Easter I miscarried our baby (THE BABY I CARRIED BUT NEVER HELD). Last year it was so hard to imagine ever being a family of five… I thought it was something that would never become a reality for us. This year I was overcome with JOY, because our sweet Leo is here with us and without that miscarriage he wouldn’t be! During Easter I am reminded of the ultimate sacrifice Jesus Christ made for us, He truly wants the best for us and continues to provide in ways I never knew were possible! I am forever thankful! Those are the words I journaled that Thursday night after taking the positive pregnancy test! Our God never ceases to amaze me! Leo was on the way! Fast forward nine months, it was only two days before my estimated due date and my scheduled c-section. My OBGYN and I came to the conclusion that a c-section was my best option for my delivery, as Leo was most likely going to be a big baby just like Lazar was. After a day of labor with Lazar (LAZAR’S BIRTH STORY), I needed a c-section because he was too big. So that is ultimately why we planned my c-section for Leo. Saturday, February 17th at 3:30am I woke up to a strong contraction. I got up to go to the bathroom and couldn’t fall back asleep, as the contractions remained consistent with ten minutes between each one. I decided to go downstairs around 5:30am and call nurse direct to let them know what was going on, since I didn’t know if my OB would just like me to come in right away knowing I need to have a c-section. The nurse connected me with the OBGYN on call and he advised me to wait until my contractions were five minutes apart (I assumed that would happen within the hour). My contractions ended up staying ten minutes apart for the entire day… It got to 3:30pm and I was getting frustrated and tired of the strong contractions every ten minutes. Paul had brought me lunch and I explained to him how uncomfortable I was, and really couldn’t imagine waiting this out for another (potential) two days until the 19th. He told me to call the OBGYN on call again and see if it was possible to come in even without the contractions being five minutes apart, because of my discomfort and ultimately knowing I need a c-section, so going through labor was basically pointless and unnecessary… The OBGYN agreed and told me he would be happy to do the c-section that night, but I would have to wait six hours since I just ate… I was so excited we were finally going to meet our rainbow baby!! 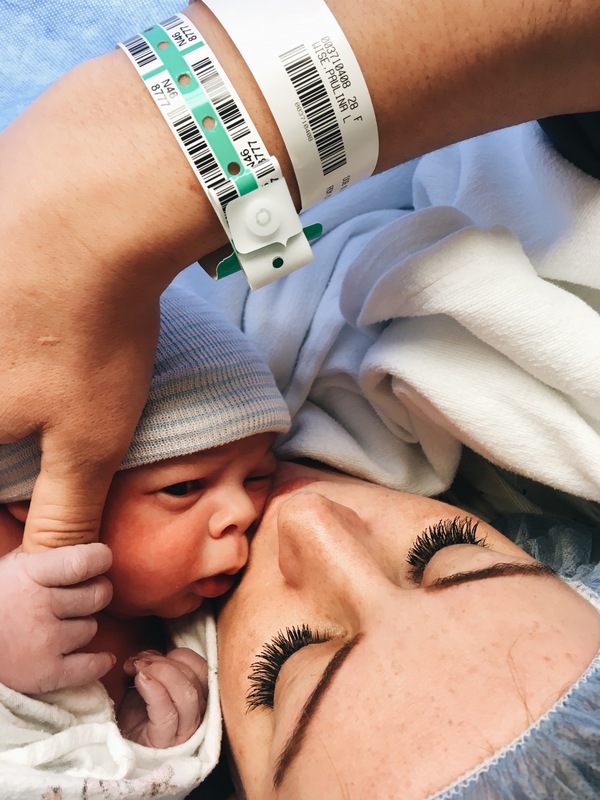 I had a scheduled c-section with Mila (MEETING MILA), so I knew exactly what to expect. You go in, get undressed put a hospital gown on and the nurses start to prep you for surgery, lots of questions and a poke or two for the IV to get fluids started. I remember being overly nervous about the spinal I was about to receive. All I could think about was a giant needle going into my spine and getting slightly worried something could go wrong… I remember sitting in the hospital bed, being hooked up to a monitor to hear Leo’s heartbeat, and just asking God to be with me! I was honestly too nervous to string together a well thought-out prayer, all I knew was I needed HIM there with me and I knew He was! I knew HE was there because this was honestly the smoothest delivery! I felt so calm and at peace, it was different than the other two births… there was an extremely positive vibe throughout the surgery room and I just knew God was there guiding the whole thing! It was extra special and honestly meant to be that I went into labor on a Saturday, because normally only one person is allowed into the surgery room, but because there were no other c-sections that day (they don’t schedule on Saturday’s) my Mom was able to be in the room along with Paul! This was such a blessing, as she was able to watch the entire surgery. Paul doesn’t want to watch what happens on the other end of the curtain so I loved hearing all about what my Mom was able to see! She also video tapped the Doctor pulling Leo out and I will forever cherish that video! The cord was wrapped around his neck twice! Watching the OBGYN unwrap it from Leo’s tiny, fragile, little neck is so emotion for me to watch… that is something that could’ve taken Leo away from us, BUT God was there and He wasn’t going to let anything stand in the way! Our Leo had arrived! Our rainbow baby, the baby I didn’t know if I would ever get… Here and healthy as could be weighing in at 9lbs 10oz 21.5inches long! It’s amazing the immediate LOVE you feel the second you hear those first cries! There is always an intense pressure you feel as the OB pulls the baby from your womb, it’s like getting socked in the stomach, taking your breath away, although there isn’t pain associated with it, just pressure… LOTS of pressure… it’s such a strange sensation, but amazing all at the same time! Birth is a gift and miracle from God that I am so thankful I get to experience. I used to get really upset over the fact that I need c-sections, but I’ve come to realize that they are a blessing allowing our babies to arrive safely! I don’t take any of it for granted! I was able to hold Leo right after he was born and it was honestly the most precious gift! After Lazar and Mila were born, I just wasn’t doing well enough to be able to hold them. So getting these first moments with Leo were so special to me! After I was all stitched up and back in my hospital room, the nurses come to check on you and make sure your uterus is starting to shrink back down. They push on your belly and it’s the most awful feeling… but having Leo in my arms is sooooo worth the pain! After the first couple pushes on my belly, the nurses exchanged concerned looks… they explained to me that I was loosing too much blood. They made calls to the OB and he said if it didn’t lighten up, to give me a suppository of medication to slow the bleeding and help my uterus shrink. The medication didn’t help and the nurses couldn’t explain why… they told me I would need a blood transfusion if things didn’t change…and quick. I felt overwhelmingly calm and just asked God to provide, I clearly and precisely asked Him to regulate my bleeding so I wouldn’t need the transfusion, I didn’t want to use blood that might save someone else’s life. He did exactly what I asked, my blood count was PRECISELY at the cut-off point for not needing a transfusion! Leo and I spent the first couple nights together in the hospital alone. Paul stayed home with Lazar and Mila and I didn’t want to ask any family to stay with me in the hospital since it is honestly a restless experience, having nurses constantly checking in on you in the middle of the night, not to mention the couch/bed they offer is the furthest thing from desirable… I thought I would be really lonely , but it happened to be a really sweet time with just Leo and I. I enjoyed our one-on-one time together and it’s something I’m going to cherish for a lifetime! Paul brought Lazar and Mila everyday and I adored their visits along with all the family and friends visits as well! Typically after a c-section they want you to stay in the hospital for four days, but I was able to return home after only two days and I certainly wasn’t complaining! I know some Mama’s with multiple kiddos like to stay in the hospital as long as they can for the extra peace, quite and nurse assistance, but I am most comfortable being at home with Paul and our babies! I couldn’t wait to get home and start our life together as a family of five! I wasnt sure how Lazar and Mila would acclimate having a new baby around, but they did and are doing amazing! I am blessed to be surrounded by the most loving family who helped during my healing process! My sweet Mama came over almost everyday to help with Lazar and Mila, having her cook some of my favorite meals on top of that was such a blessing! It’s as if time moves in slow motion after you bring a baby home and I love that my Mom is able to spend those first couple weeks with me; it’s time we get to have together that we wouldn’t have otherwise and I cherish it… it’s just a happy time all-in-all! Transitioning from two to three kids has had it’s challenges for sure, but it has ultimately been one of the greatest things to happen to us all! Leo is almost two months old and he has been a dream come true! Lazar and Mila wake up every morning asking about him and wanting to hold and kiss him! Nothing makes me happier than to see all three of my babies love on one another! HAVE FAITH MAMA(S)… whether you are in the storm or experiencing the rainbow, aways remember God is right there with you, He wants the very best for you and when you rely on Him, putting all your trust in Him, you will experience dreams unfold before you plus some you never thought possible! I’ve been catching up on your blogs lately and have totally enjoyed your stories and wisdom! It gives me some Momma insight which I know I will need. Thanks for sharing, Beautiful family Paulina! Such kind words! Thank you so much Emily!